For more go to www.espn.com. 2. Cory Lopez 8/Yellow Indian Beach Rocks, Fla.
3. Dean Randazzo 1/Red Atlantic City, N.J.
4. Damien Hobgood 6/Pink Satellite Beach, Fla.
1. C.J. Hobgood 4/Blue Satellite Beach, Fla.
2. Asher Nolan 2/Yellow Neptune Beach, Fla.
3. Kelly Slater 7/Red Cocoa Beach, Fla.
4. Aaron Cormican 9/Pink New Smyrna, Fla.
1. Bryan Hewitson 10 Indialantic, Fla.
2. Peter Mendia 3 West Palm Beach, Fla.
1. Rob Machado 9/Blue Cardiff, Calif.
2. Shane Beschen 1/Yellow San Clemente, Calif.
3. Taylor Knox 3/Red Carlsbad, Calif.
4. Mike Losness 4/Pink San Clemente, Calif.
2. Pat O’Connell 5/Yellow Dana Point, Calif.
3. Tim Curran 8/Red Oxnard, Calif.
4. Dane Reynolds 6/Pink Ventura, Calif.
1. Jason Collins 2 Santa Cruz, Calif.
2. 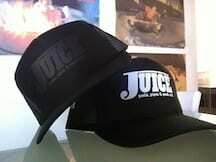 Nate Yeomans 10 San Clemente, Calif.
1. Sandro Dias 518 Santa Ana, Calif.
3. Danny Mayer 547 San Diego, Calif.
1. Lyndsey Adams Hawkins 501 Cardiff By the Sea, Calif.
2. Cara-Beth Burnside 502 Encinitas, Calif.
4. Jen O’Brien 508 Vista, Calif.
5. Holly Lyons 507 Walnut Creek, Calif.
RAMONES TO RELEASE ‘RAMONES RAW’ – SEPTEMBER 28 VIA IMAGE ENTERTAINMENT – FIRST OFFICIALLY AUTHORIZED DVD, CHRONICLING THEIR LEGENDARY CAREER… The pioneering group will release their first officially authorized DVD RAMONES RAW September 28 via Image Entertainment. From their humble beginnings in NYC’s East Village at CBGB’s to their 2001 induction into the Rock and Roll Hall of Fame, the RAMONES have stood the test of time with their immortal brand of music which continues to influence generations around the world. Fans in the U.K. will have the chance to see RAMONES RAW on the big screen at this year’s Raindance Film Festival in London–the U.K.’s largest independent film festival–from September 30 through October 10. Along with three decades of insane RAMONES live footage–most of which is seen here for the first time–RAMONES RAW offers fans an unprecedented look at the inner-workings of JOHNNY, JOEY, DEE DEE, MARKY and CJ, their off-beat sense of humor and unique camaraderie. With over five hours of rare material spanning the RAMONES’ history-making career (circa 1976-1996), RAMONES RAW offers an endearing personal glimpse into the madness and mayhem of one of the world’s most legendary punk rock bands. The DVD is packed with 20 vintage live performances of RAMONES classics including ‘Blitzkrieg Bop,’ ‘I Wanna Be Sedated,’ ‘Sheena Is A Punk Rocker,’ ‘Gimme Gimme Shock Treatment,’ along with the rare gem ‘I Can’t Make It On Time.’ Bonus features include an audio commentary option with JOHNNY, MARKY and RAMONES RAW director John Cafiero as well as ‘Ramones’ Live In Italy, a 27-minute live performance not seen since its original broadcast on European TV in 1980. The DVD encompasses an eclectic mix of celebrity appearances including guitarist Robby Krieger of the Doors performing the classic ‘Take It As It Comes’ live with the RAMONES at the Hollywood Palladium in October 1992, described by JOHNNY RAMONE as ‘one of the highlights of my career.’ Fun cameos and TV clips include moments with Debbie Harry and Chris Stein of Blondie, Bono and U2, Drew Barrymore and Carly Simon, to name a few. Check out the following links for up-to-date information: www.ramones.com. ROCK AGAINST BUSH VOL. II OUT AUGUST 10TH! Bands like Green Day, Lagwagon, No Use For A Name, Yellowcard, Dropkick Murphys, and tons more have contributed to this 28-track protest song. You can get this comp now at the Punk Voter booth on the Warped Tour OR through Fat mailorder…and it’s cheap too, so order it now! Go to www.fatwreck.com and www.punkvoter.com. FUEL TV EVENTS: Salomon Masters 2004 (August 14th @ 2:35pm ET/PT) – This number one World Qualifying Series event at the Margaret River in Western Australia highlights some of the world’s best surfers all in one shot…. Blue Carpet Special: CHICHagoF (Tuesday, July 27th @ 10:34pm ET/PT; Weds. July 28th @ 9:30am ET/PT and 10:02pm ET/PT; and Sunday, August 1st @3:35pm ET/PT) FUEL gets a special pass into the Volcom premiere of ‘Chichagof ‘, located at the Veeco headquarters in Costa Mesa, CA. The voice of skateboarding, Dave Duncan, guides Fuel through the wild night filled with visits from pros, filmmakers, and party people. Two thousand plus skateboarding enthusiasts showed up to see the new film ‘CHICHagoF’. Volcom also unveiled a new skate park right in their warehouse, which drew some amazing sessions throughout the evening. This premiere is unlike any other Fuel Blue Carpet you might have seen before…. Blue Carpet Special: Riding Giants (Sunday, August 8th @ 10:37pm ET/PT) – In this episode of Fuel’s Blue Carpet Special we go coast to coast and cover the exclusive, star-studded Hollywood and Hamptons premiere of Stacy Peralta’s ‘Riding Giants,’ the only documentary ever to open the Sundance Film Festival. 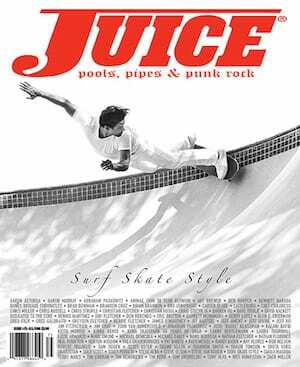 The special includes behind-the-scenes footage as well as in-depth, sit-down interviews with Stacy Peralta, Greg Noll, Jeff Clark, Sam George and Laird Hamilton as they share their experiences and insights on the making of the film. GRAVITY GAMES – Flying High for Outdoor Life Network – OLN Announces Television Schedule, Expanded Competitor Field and New Gravity Games Events… Outdoor Life Network, owner of the Gravity Games, is pleased to announce the complete television schedule for the event, expanded competitor fields and two major extensions of the Gravity Games franchise. The 2004 Gravity Games will take place from September 15th – 19th in Cleveland, Ohio. In total, OLN will air 17 hours of original Gravity Games coverage, beginning with a two-hour preview show on September 20th at 9:00 PM ET/8:30 PM PT. From September 21st – 25th, the Gravity Games Skateboarding, BMX and Freestyle Motocross competitions will air each night at 8:00 PM ET/8:30 PM PT. The coverage will include highlights from the concerts and activities surrounding the event. Encore coverage will make for a total of more than 70 hours of the Gravity Games on OLN. Additionally, the competitor field at the Gravity Games will be expanded from 20 to 25 competitors in the skateboard street and bike street competitions. While many other action sports events are limiting their competitor fields, OLN is giving more action sports athletes the chance to compete. OLN also announces two major extensions to the Gravity Games franchise: Gravity Games H20 and the 2005 Winter Gravity Games. With expanded global interest in emerging action sports, Gravity Games H2O, is set to take place off Australia’s western coast city of Perth from October 14th – 17th, 2004. The event will include Wakeboarding, Kitesurfing and a Tow-In Surfing exhibition. OLN will televise coverage of the event on November 15th and 16th at 8:00 PM ET/PT. Gravity Games H2O will mark the first time Kitesurfing and Surfing disciplines have joined the Gravity Games stage, adding more than 50 new athletes to the Gravity Games family of competitors. Gravity Games H2O will award AUS$200,000 ($140,000 US) in prize money. More information can be found at www.gravitygames.com/H2O. OLN is currently evaluating several potential host cities for the 2005 Winter Gravity Games, which can include Superpipe, Slopestyle, Boardercross, Skicross, Snowcross and Snowmobile Cross competitions. Updated news and information on the event can be found at www.olntv.com. MOVIE NEWS FROM TEXAS – Ion feature film does not concern rival gangs of jousting boarders, a washed-up talent agent, a big competition where Leif Garrett saves the day, etc, etc. It’s about regular skaters doing regular stuff, which we all know can get pretty exciting and dramatic even without murder mysteries or giant ollies over tour busses filled with silicone hotties. Skaters seem to recognize themselves in this film, something that hasn’t happened much with Hollywood’s cash-in attempts. One reason for this is that the principal cast consists of real skaters, playing real skaters. From behind the Pine Curtain in east Texas, I started skating even before ‘back in the day,’ with clay wheels, the whole bit. Urethane and rock and roll saved me from a life of cows and beer. Pools and ditches taught me about spirituality, which is probably just another word for style. The first generation of parks, well that was a lesson in consumerism and the so called dry spell that came after didn’t mean much to the average hard-core skater, none of us were sponsored anyways. These days I ride (and make my own) longboards but the thrill is still the same, surf or skate. Like D. Boon said, ‘Punk rock changed our lives’ and I’d go so far as to say it saved mine. 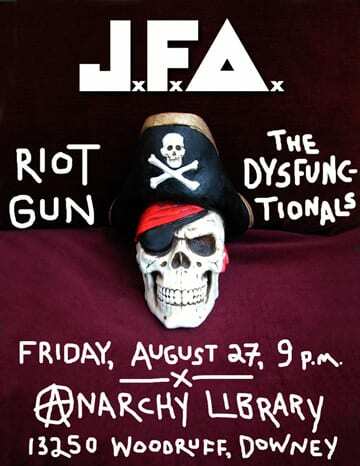 Another great part of making this film was reconnecting with all the bands that gave us music – from the SST groups like Black Flag, Meat Puppets, Minutemen to the Big Boys, Replacements and regional greats like the Reducers and Texas Instruments – just a ton of music. The director is Clark Walker and the distributor for the film is a NY company called Hart-Sharp, and the film’s producer, Anne Walker-McBay is responsible for movies like DAZED AND CONFUSED, SUBURBIA, WAKING LIFE and BEFORE SUNSET, which is now in theaters. We’re still shopping the soundtrack to different labels, but look for that soon, too. In the meantime, go to www.levelland-themovie.com for a sneak peek. FUEL TV NEWS – FSN, FUEL and Quiksilver Entertainment Combine to Produce News-Oriented, Weekly Version of Original 54321 — Fox Sports Net (FSN) and FUEL are combining with Quiksilver Entertainment to produce FUEL’S 54321 WEEKLY UPDATE, a new, fast-paced half-hour weekly spin-off of FSN’s original 54321 that highlights the most important events and news from the world of action sports. The announcement was made today by Bob Thompson, President, Fox Sports Networks and David Sternberg, Executive Vice President, Emerging Networks, Fox Cable Networks, who also serves as FUEL’s General Manager. FUEL’S 54321 WEEKLY UPDATE is set to premiere on Saturday, Sept. 18 on FSN, with FUEL providing additional opportunities to see each week’s show throughout the weekend. FUEL’S 54321 WEEKLY UPDATE is a highlight-driven action sports news program, which will spend much of its time reviewing the week in action sports and previewing upcoming events and demonstrations. Quiksilver Entertainment is partnering with FUEL and FSN in the development of the series, and will be credited as co-executive producer. The show also reports on relevant athlete endorsement deals, new product releases and cultural events, like film premieres and art festivals, from around the globe. In winter months, the show is also planning to provide skiers and snowboarders with predictions on where to find the best powder, while in the summer, surfers can learn where to find the best waves. For the latest up-to-the-minute sports news and opinions, visit the FOX Sports/Fox Sports Net website at www.msn.FOXSports.com or www.fuel.tv. 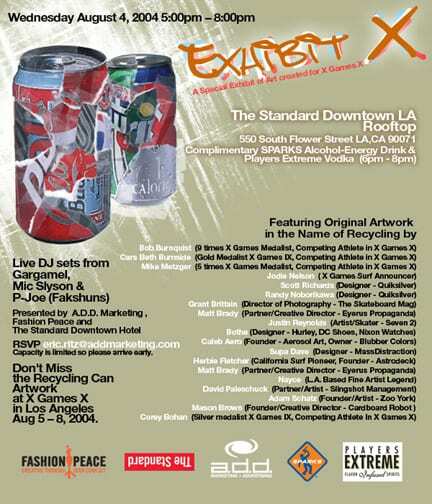 EXHIBIT X – WED. AUG 4, 2004 – 5PM-8PM – EXHIBIT X – A special exhibit of art created for X Games X at The Standard Downtown LA Rooftop – 550 South Flower St. LA, CA – RSVP to eric.ritz@addmarketing.com. GLOBE NEWS – TAJ BURROW WINS THE US OPEN OF SURFING IN HUNTINGTON BEACH, CA – In the final minutes of the wave starved final, a head-high wall marched through the south side of Huntington Beach Pier straight to Globe team rider Taj Burrow. As the wave approached a collective roar of the crowd could be heard all the way down Main Street, and Burrow answered back by floating over the impossibly long first section, then blasted three upside-down backhand snaps annihilating the mushy peak, the poor wave never had a chance. Taj’s surfing throughout the competition could only be described as unrestricted; in every heat he pushed each turn further or boosted each air higher. Taj squeezed four turns in the wave where most would only get two, the judges agreed and granted Taj the points to clinch his first US Open win, and upset last years Huntington Beach winner Cory Lopez, powerful Australian Trent Munro, and Hawaiian Fred Patacchia. After the dust settled from an estimated 300,000 people visiting the historic grounds of the US Open, Burrows took home the $15,000 USD. For more visit www.globeshoes.com. ED RYAN BENEFIT SKATE JAM-DISPLAY AUCTION-SKATEROCK BLOWOUT -SATURDAY, AUGUST 14, 2004 – On Saturday, July 3rd Ed Ryan, owner of Drop in Skate Shop in Phoenix, Arizona, was shot while closing up for the night in a botched robbery attempt. The near fatal shooting left Ed in intensive care. Ed’s wife Kari is expecting a child the first week of August. This tragic and senseless event has mobilized the skate community to help Ed get back on his feet and keep his shop open. Saturday, August 14th the Phoenix Skatepark at Metro Center Mall will host a benefit auction, skate jam and skaterock blowout to raise money for Ed and Kari Ryan through an auction of skate products donated by numerous skate shops and skateboard industry leaders. Cash donations can be sent via PayPal to: edryanfund@yahoo.com. All product donations be sent to: Ed Ryan Benefit – 7905 E Wilshire Dr. Scottsdale, AZ 85257. Don’t send packages to the Drop In Skate Shop as the shop is temporarily closed. SkateJam Location: Phoenix Skate Park 9617 Metro Parkway W., Suite 2129 Phoenix, AZ 85051 – Phone: (602) 870-8727 or www.phoenixskatepark.com. SkateJam Date: Sat., August 14, 2004 – 7pm-12am… For details e-mail event coordinator Robert Locker (Owner of AZPX Skateboards) at rob@azpx.com or go to www.azpx.com. Tentative band line up: Greenhaven, Smoky Mountain Skull Busters, Bullet Train To Moscow and Oktober… Contributing Sponsors include: The Grind Boardsports, Pulse Skateboards, Cowtown Skateboards, Cal Daze Skateboards, Sidewalk Surfer, Fast Forward, Boardwalk Skate Shop, Utility Board Shop, Thrifty Board Shop, Syndrome Distribution, JWID Distribution, Powell, Vans, NHS, Conspiracy Skateboards, Cowboy Punk Wheels, SK8NUTS, Ricta Wheels, Diamond Audio, Rockford Fosgate, Sole Technologies, Socko Energy Drink, Phoenix Skate Park, ABC, Duffs, Sacrifice Skateboards, Punk Rock Skateboards, Frys Food Stores, Santa Cruz, DC Shoes, Amerikan Clothing, Rebel Skates, Red Bull, Black Label, Factory 13 Skateboards, Skaterbuilt, Silver Trucks, Phantom Trucks, Alien Workshohp, Seek, Habitat, FKD, Element, Dakine and Fender. 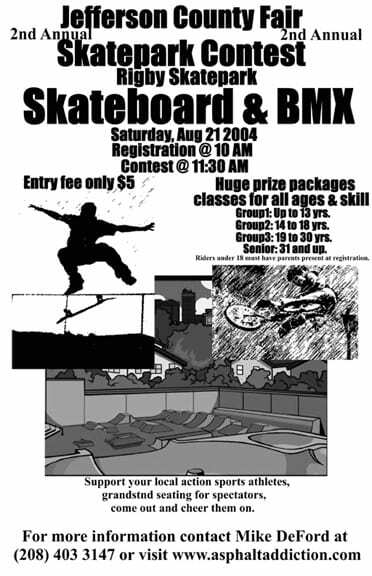 SKATE CONTEST – Olliewood is sponsoring a Gravity Games skate contest at Ryans World in Chapel Hill, NC on August 4th 2004. For more info or to participate as a sponsor send product to or contact John Epps at Olliewood Skate Shop 12283 Capital Blvd Wake Forest NC 27587 or call 919-570-Deck or 919-570-5300. SURF AND REGGAE EXPO – KULCHA SHOK MUZIK in association w/ JAH SURF Present their second bi-annual surf and reggae expo; every August and December. The next one happens the last Thursday in August Thursday Aug 26th 7pm at the Corner Bar in Coconut Grove(Miami) 3310b Mary St. Sponsors include P Shapes surfboards, Chilo Surfboards, Hakson Clothes, Surfrider Foundation, KULCHA SHOK MUZIK, http://www.Krystal-Planet.com(wind energy), Maka Hawaii board shorts, Quiksilver, Tree of Zion, Blackies/Wahine Blue and Surfboards Miami, Skybanditz kiteboarding, Mia Skateshop/Control Skate park, Coco Water, Now Boarding Surf Shop/Las Olas surf products among many others. The event will have 4 live acts/bands: Surfer/RAS recording artis from Barbados David Kirton doing a special and rare acoustic set for the first time in Miami, KULCHA SHOK MUZIK recording artist WOOKIE J, in support of his new album ‘NATTY NEVER WEARY,’ roots/rcok/reggae band UPROOTED feat. 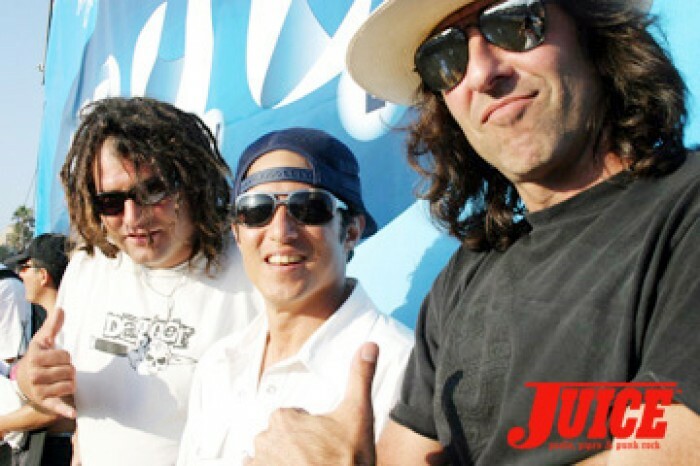 JAHSURF sponsored surfer Alex Casal, and reggae/ska band JACUZZI FUZZ. There will also be lots giveaways, a surfboard raffle, surf lessons and a real good time. For more information please call LANCE-O @ 305 534 6110 or visit www.kulchashok.com. X GAMES BIG AIR EVENT – New ‘Big Air’ Event for Summer X Games – From DC – This year’s summer X-Games (to be held in Los Angeles, California August 5-8, 2004) has just gotten a whole lot more interesting. The contest organizers have recently added ‘Big Air’ to the skateboarding event, where a version of Danny Way’s famous DC Mega Ramp will be used in the actual competition. The X-Games Big Air ramp will consist of a 60-foot roll-in, followed by a gap jump with landing ramp, complete with a large quarterpipe at the bottom – very similar to the Mega Ramp you’ve seen Danny annihilate in The DC Video. 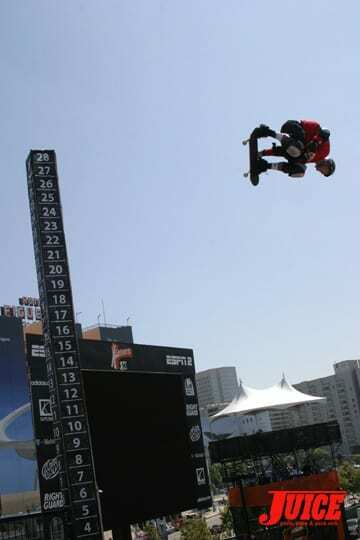 The Big Air Finals will be held on August 8, 2004 at the Staples Center. You can catch the Big Air Finals live August 8th telecast at 6:00 p.m. on ESPN, and on ABC primetime the following Sunday night. Check out the EXPN site for more. BENEFIT FOR SURF AID INTERNATIONAL – September 11, 2004, La Jolla, California – On September 11th, 2004, the second evening of the ASR (Action Sports Retailer) Trade show in San Diego, California, a fundraiser will be held to benefit Surf Aid International, a surfer’s based charity focused on helping eradicate malaria and other illnesses from the Mentawai Islands, in Indonesia, one of the world’s prime surfing areas. This event is being organized by ISA President’s brother, Santiago Aguerre and is a wonderful opportunity for you to contribute to a great cause. Tickets go on sale June 15th, with only 300 available. Surf Aid International’s (SAI) overall mission is to promote health and social programs throughout the Mentawai Islands community and to encourage and coordinate the support of the global surfing community. In the worst areas of the Mentawai Islands, 50% of children will die before end of five. 70% of families have lost at least one child, (PRA data – UNESCO, Yayasan Citra Mandiri 2000-2001). Almost all childhood deaths are from preventable and treatable diseases such as measles, tetanus, malaria, and diarrhea. At any one time up to 50% of Mentawai people carry the malaria parasite, which causes severe suffering and death. The existing Mentawai health system is greatly under-resourced and has an urgent need for doctors, nurses, training, and medical supplies. For more information about Surf Aid International, please visit www.surfaidinternational.org. JEFFERSON COUNTY FAIR SKATE CONTEST – AUG. 21, 2004 – The second annual Jefferson County Fair Skatepark Contest is going down on August 21st at the public park in Rigby, Idaho. Entry fee is only $5 and there will be prize packages and a large product toss during the event. THIRD ANNUAL MOUNTAIN DEW FREE FLOW TOUR SENDS MASSACHUSETTS SKATEBOARDER TO SKATE WITH THE PROS AT X GAMES X IN LOS ANGELES – Mountain Dew today announced Emanuel Santiago, 17 of Lowell, Mass. as the grand prize winner of this year’s Mountain Dew Free Flow Tour. Competing against the entire Mountain Dew Free Flow Team at the Encinitas YMCA Skatepark on July 31, Santiago was selected by Mountain Dew pros Shaun White, Rune Glifberg and Pat Channita as the top skateboarder of the tour and will go on to practice with the pros on the competition street course of X Games X in Los Angeles. Sponsored by boardsports veteran brands Powell Skateboards and Split Clothing, the 2004 Mountain Dew Free Flow Tour kicked off May 15 in New Hampshire and visited 13 skateparks around the country, sponsoring amateur skateboarders and stoking crowds everywhere it visited. When it was all said and done, 39 top amateur skateboarders secured spots on the Mountain Dew Free Flow Tour team this year, bringing the total number of members to 118 over the past three years of the Mountain Dew Free Flow Tour’s existence. In addition to a free trip to the Encinitas Finals Event, each Mountain Dew Free Flow Tour winner received a $200 Mountain Dew ‘Skate Scholarship,’ free gear from Mountain Dew and tour sponsors, and plenty of free Mountain Dew. The current 2004 Mountain Dew Free Flow Skateboard Team roster is as follows: Emanuel Santiago – Age 17, Ben Hatchell – Age 14, Ryan Holloway – Age 15, Chris Mendes – Age 15, Dave Abair – Age 17, Derek Gertz- Age 15, Joseph Fields – Age 17, Fabian Borgmann – Age 18, Dave Bachinsky- Age 17, Dave Weitzel – Age 15 Alan Poole – Age 14 Justin Figueroa – Age 14, Kyle Walker – Age 18, Abdias Rivera – Age 17, Julian Christensen – Age 15, Sean Stem – Age 14, Anthony Williams – Age 16, Cody Hale – Age 15, Collin Hale – Age 17, Brad Cromer – Age 16, Julian McCracken – Age 16, Willy Akers- Age 17, Adam Burgoon – Age 16, Adam Romero- Age 16, Mike Mann – Age 16, Dominique Johnson – Age 16, Josh Hawkins – Age 17, Andrew Cannon- Age 18, Ricky Martin – Age 17, Brandon Payne – Age 19, Shaun Williams* – Age 16, Travis Glover – Age 15, Joey Flores – Age 16, Nick Merlino – Age 16, Blake Merceer – Age 15, Mike Soborik – Age 16, Elliott Coss- Age 16, Dustin Edwards – Age 14, Greg Milligan – Age 18… Check out www.mountaindew.com for additional information on Mountain Dew’s commitment to the action sports community. Tour winners were also featured on the Mountain Dew Free Flow Tour website, www.freeflowtour.com. 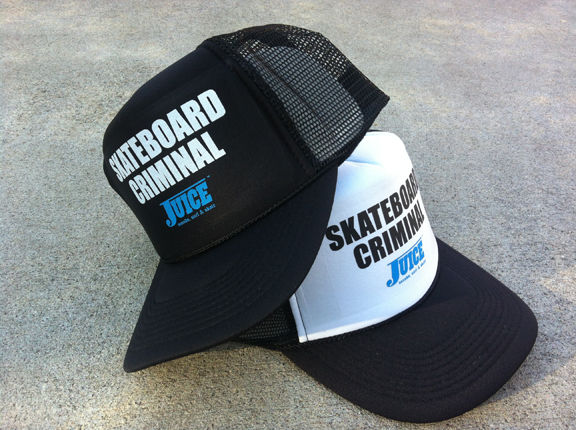 JUICE MAGAZINE and the USSA and WSA are proud to announce the first ever Wall Ride World Record Winner… at the Board Gallery Grand Opening, August 22, 2004, Hollywood, CA. WORLD RECORD FOR THE HIGHEST WALL RIDE: BRAD EDWARDS – 7’6″ and AARON MURRAY – 7’6″. Brad Edwards tied with Aaron Murray for the World Record at 7’6″. According to the rules, in the instance of a tie the measurements of all three attempts were added together which gave Brad Edwards 1st place. 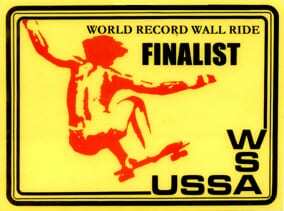 WORLD RECORD WALL RIDE FINALISTS – ERIC BRITTON – 7’1″, BENNETT HIRADA – 7’1″, JIMMY ‘THE GREEK’ – 6’10”, FRANK HIRATA – 6’10”, MIKE SANTAROSSA – 6’5″, DUSTIN TAYLOR – 6’5″, STACEY LOWERY – 6’3″, ALEC BECK – 6’3″. SIRIUS SATELLITE RADIO: Skaters, Surfers, and Supergroups: Tony Hawk, Kelly Slater, Velvet Revolver, Barry Williams, Newport Jazz Fest and more, exclusively on SIRIUS This Month… On July 20, SIRIUS debuted Tony Hawk’s Demolition Radio. With a custom-built studio at his world-famous skate headquarters in Vista, CA, Tony will play his favorite tunes and host celebrity guests, including his friends and fellow athletes from the extreme sports world. Champion surfer Kelly Slater’s Radio K-OS show will debut August 22 at 9 pm on Faction. This six-time world champion will play music that inspires him, interview musicians, and host surfing’s biggest names. For more information on SIRIUS Satellite Radio, go to www.SIRIUS.com. TEENFEST – Oct 16 – TeenFest – The city of Fontana [CA] is having its TeenFest on Saturday October 16, 2004. This free one-day event will include two entertainment stages, a skateboarding competition show, featuring some of Southern California’s skateboarding champions, Nintendo USA, KISS-FM celebrity baseball game against the Los Angeles Dodgers, and showcasing local musical talents via ‘Teen Sensations’ singing competition. The event will be held at Jack Bulik Park 16581 Filbert Avenue. A portion of the proceeds will go to support future teen programming via the Fontana Police Explorers Post, Dream Builders and various other youth groups such as the Fontana Teen Center. Major vent sponsors include: Bel Air Swap Meet, Fiesta Development, Valley Auto Center, among additional local supporters. 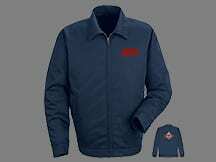 For info go to www.seguebiz.com or www.fontana.org. RAMP WARS – Aug 26 – A Benefit for Boulder, CO skatepark. 9am-5pm. Ramp Wars! 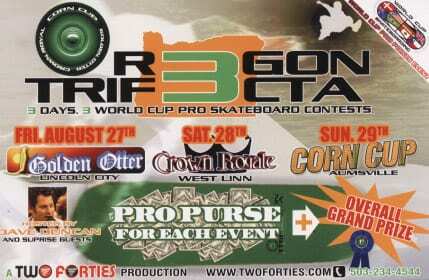 is an all skater organized and run skateboard contest taking place in the NE corner of the Crossroads Mall parking lot. Proceeds go to the cost of the New Boulder Skatepark now under construction at Scott Carpenter Park. For more go to www.brothersboards.com. LG ACTION SPORTS CHAMPIONSHIPS -SEPT. 10-12 – LG has announced the second-annual LG Action Sports Championships event and expo, starting September 10th at Fairplex in Pomona, Calif. during the Los Angeles County Fair. The action-packed event will feature the season’s U.S. and World Championships for skateboarding, aggressive inline skating, freestyle BMX and freestyle motocross, as well as big-name music entertainment from Hoobastank, Lonestar, LIVE and many more bands. The event will comprise seven days of adrenaline-pumping competition from such action sports legends as Nate Adams, Mike Meztger, Brian Deegan, Bob Burnquist, Bucky Lasek, Andy Macdonald, Ryan Nyquist, Jamie Bestwick, Eito Yasutoko, Fabiola Da Silva and 160 more pros, The professional Championships in skateboarding, inline skating and BMX will be held September 10-12, the amateur Championships in skateboarding and inline will be held from September 24-26, and the World Championships of Freestyle Motocross will be held on October 2nd. During the 11 non-competition days, the site for the various competitions will be open to the public as an open skate park for action sports enthusiasts to actually use the pro course. LG ACTION SPORTS CHAMPIONSHIPS – Sept 10-12 – LG has announced the second-annual LG Action Sports Championships event and expo, starting September 10th at Fairplex in Pomona, Calif. during the Los Angeles County Fair. The action-packed event will feature the season’s U.S. and World Championships for skateboarding, aggressive inline skating, freestyle BMX and freestyle motocross, as well as big-name music entertainment from Hoobastank, Lonestar, LIVE and many more bands. The event will comprise seven days of adrenaline-pumping competition from such action sports legends as Nate Adams, Mike Meztger, Brian Deegan, Bob Burnquist, Bucky Lasek, Andy Macdonald, Ryan Nyquist, Jamie Bestwick, Eito Yasutoko, Fabiola Da Silva and 160 more pros, The professional Championships in skateboarding, inline skating and BMX will be held September 10-12, the amateur Championships in skateboarding and inline will be held from September 24-26, and the World Championships of Freestyle Motocross will be held on October 2nd. During the 11 non-competition days, the site for the various competitions will be open to the public as an open skate park for action sports enthusiasts to actually use the pro course.